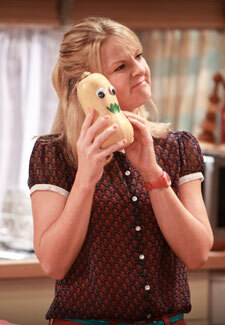 Sarah Hadland is best known for playing Miranda’s tiny sidekick Stevie, and she admits that real life sometimes reflects the sitcom. ‘I absolutely love spas, but I can get the giggles,’ says Sarah, 41. ‘Especially when I’m having one of those mud wraps where they put you in a body bag. ‘It happens when the whale music goes on and the therapist leaves the room. I start thinking, “I’m not sure about this, I might actually need a wee.” ‘It’s ridiculous, because it’s supposed to be relaxing and you spend the whole time panicking about your bladder.